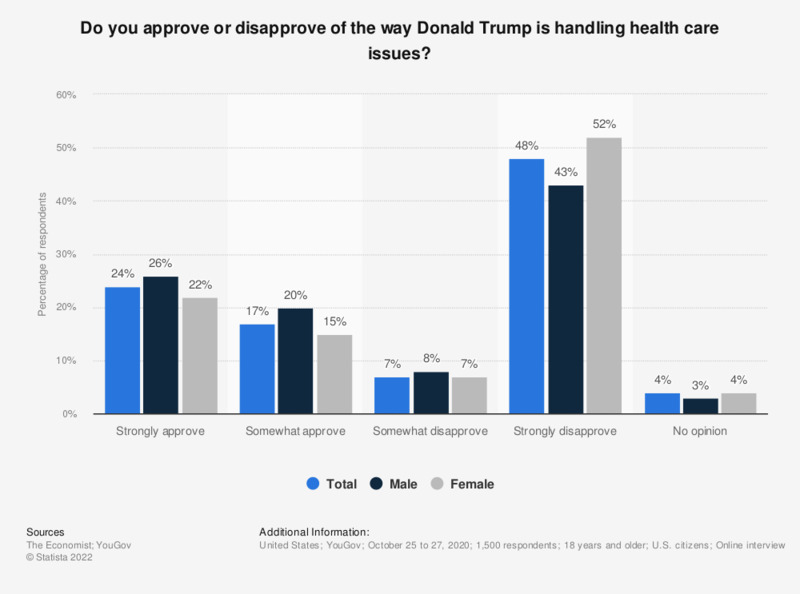 This statistic presents the opinions of U.S. respondents, by gender, if they approve or disapprove of President Trump's handling of health care issues, as of January 2019. It was found that 38 percent of all respondents approved of Trump's handling of health care issues in some way. Statistics on "Health care and cyber security"
Do you think health care will be a major topic for the Trump administration? Did Trump’s plans concerning health care have an influence on your vote? Irrespective of whether or not Trump will repeal the Affordable Care Act, how do you think the US health care system will develop under Trump? In 2018, do you think things will be better off or worse off than they were in 2017 when it comes to health care coverage? Do you generally approve or disapprove of the 2010 Affordable Care Act, that restructured the U.S. health care system?